At a recent wedding in the Cotswolds, I saw a sign that said ‘Pick A Seat Not A Side. My initial thought was “wow, that’s bold, letting guests choose where they want to sit at the wedding breakfast” but then I realised, that the sign was actually positioned on the pathway to the ceremony location, in the glade. Having established that the wording related to the age old tradition of the bride’s friends and family sitting on opposite sides of the church to the groom’s guests, it got me thinking about the general merits, or otherwise, of table plans and my initial response when I read the signage. Some of the most memorable weddings I have been to are those where I have been seated with my closest friends or family members. The familiarity of the other guests has resulted in a very relaxing, enjoyable occasion. Why would you choose to do it any other way? Everybody’s happy. 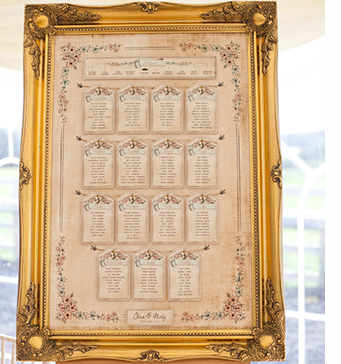 A seating plan is often a necessity when there are guests who are divorced or separated amongst the invitees. Anticipating their relative positions at the wedding breakfast can avoid any awkwardness or confrontation. Wedding venues are always laid out for exactly the right number of confirmed guests. Letting guests choose where they sit can end up with odd seats at tables and couples and family members being split up, which isn’t an ideal scenario. Your venue should always ask if any of your guests have specific dietary requirements. They then transfer this information onto their planning sheets and brief their waiting staff accordingly. By identifying where each special guest is seated the service of the meals should be faultless. Our couples often cite “the dreaded table plan” as the most stressful part of organising a wedding. At the end of the day, your wedding day is all about the two of you and planning time should not be spent agonising about the guests seated either side of cousin Phil and whether they will tire of his boring conversation! Avoid the stress - let them choose their own seat. Your wedding is a fantastic opportunity for two sets of friends and family to meet and get to know each other, so let fate take its course and see who ends up sitting next to each other – maybe you’ll be at their wedding in 12 months time! Formal table layouts and restrictive table plans don’t suit the tone of all weddings. For example, trestle tables laid out end to end, can create a more relaxed atmosphere which lends itself to guests finding their own seats. There will inevitably be last minute dropouts at a wedding which has a knock-on effect for the seating arrangements, particularly if you’ve gone to the trouble of having a table plan printed by your stationer. Avoid the blob of Tippex over Aunty Joan’s name by not having a plan in the first place. “So, what did you do at your own wedding?” I hear you cry. I had a table plan of course; I’m too much of a control freak when it comes to planning events. I wasn’t leaving anything to chance! Before I sign off, did you know that the church seating arrangement dates back to a time where the bride herself would be a peace offering in an attempt to unite two tribes? It was acknowledged that the two sides should be kept well apart in case one of the members showed their disapproval of the marriage and fisty-cuffs ensued. Now that would make for an interesting image in the wedding album!